Kate Crassons joined the faculty at Lehigh in 2004. Her research focuses on late medieval English literature and culture with a particular interest in religion. Crassons' book, The Claims of Poverty: Literature, Culture, and Ideology in Late Medieval England was published by the University of Notre Dame Press in 2010. She is currently working on a new book project concerning faith, epistemology, and miracles in late medieval and early modern England. Crassons teaches undergraduate and graduate courses focusing primarily on medieval literature and drama but often extending into the early modern period. Her courses are frequently interdisciplinary, seeking to examine medieval literature in relation to contemporary politics, socio-historical conflicts, and theological developments. For example, she has recently taught the following courses: "Days of Miracle and Wonder"; "Drama and Sacramental Culture"; "Poverty and Representation"; and "Sinners, Saints, and Heretics." 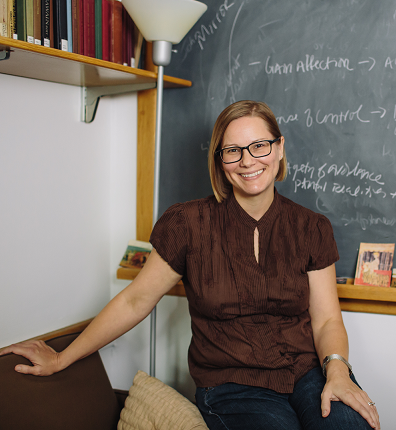 Before coming to Lehigh, Crassons earned a Ph.D. in English from Duke University, a Master's degree in English from the University of Colorado-Boulder, and a Bachelor's degree in English and Spanish from Louisiana State University.